In December of 2016, the International Center for Water Security and Sustainable Management (i-WSSM) was established as a “Category 2 Center” under the auspices of UNESCO. Hosted by the K-Water Institute in Daejeon, Republic of Korea, i-WSSM is South Korea’s fourth UNESCO-affiliated center, and its first in the Science sector. As part of preparations for operationalizing the Center, a delegation from the Ministry of Land, Infrastructure and Transport (MOLIT), which is in charge of establishing and managing the center, visited ICIWaRM from June 5-9, 2017. 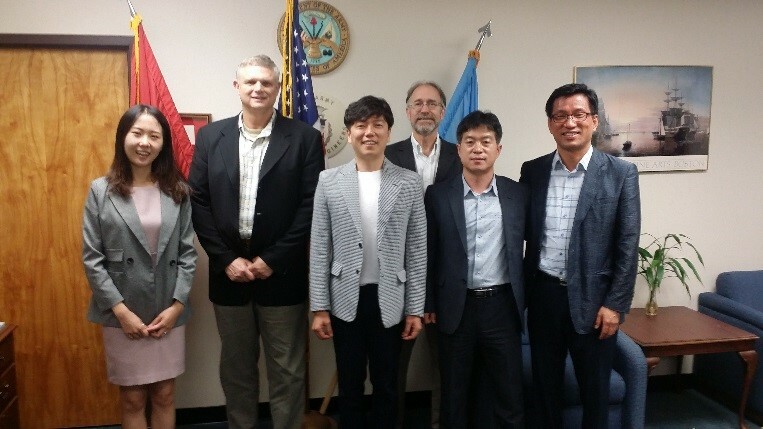 The delegation consisted of three Ministry officials: Deputy Director Ms. Lee Seul Chang and two Assistant Directors, Mssrs. Jaehyeop Son and Kangmin Lee). The visit was facilitated by Mr. Kyoung Un Bae, an engineer from the Korea Water Resources Corporation (K-Water), currently spending a year at IWR as a Senior Fellow. Currently, I-WSSM is highly engaged in organizing the “Korea International Water Week 2017” and the first “Asia International Water Week” (KIWW 2017; 1ST AIWW); both are scheduled to take place in September 2017. With the participation of professors, scholars, and engineers worldwide, the main themes to be addressed will be “Water Partnership for Sustainable Development” and “Asian Solutions for Water”.